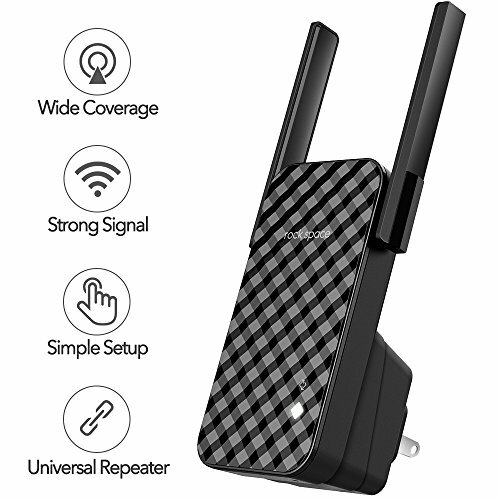 WHY CHOOSE ROCKSPACE WIFI RANGE EXTENDER? SAY GOODBYE TO DEADZONE, FULL SIGNAL COVERAGE - With this WiFi range extender, all the dead spots with weak WiFi signal will be eliminated. This wireless extender works with any standard router or gateway. 2200 sq.ft (46 ft range)360 degree full coverage. ONLY TAKES 8 SECONDS, QUICK & EASY SET UP - Only takes 8 seconds. This WiFi signal booster easily expand the wireless coverage by WPS button. Or set up via website browser in almost any device, pc or mobile phone. Easily enjoy full wifi signal coverage. NO MORE NETWORK OUTAGE, STABLE SIGNAL BOOSTS - Our WiFi extender, the best solution to date extending WiFi signal. Dual 3db antennas enhance wireless signals for stable data transmission, network speed up to 300Mbps covering everywhere in your house. COMPATIBLE WITH 99% ROUTER ON THE MARKET - No bother for choosing. This WiFi repeater has been tested compatible with 99% router, works with any standard router or gateway. High Speed expansion allows for the most ideal HD streaming and gaming experience. NOTE - Only works at 2.4G band; It's not a router; Please relocate the extender after connecting with router; Make sure mobile data is disabled when you use web browser to extend wifi; Make sure it's on power when you reset the extender by the RST button. If you have any questions about this product by ROCK SPACE, contact us by completing and submitting the form below. If you are looking for a specif part number, please include it with your message.